The asylum granted to WikiLeaks’ founder Julian Assange by the government of Ecuador is not in question, despite possible differences of opinion between the two on the release of controversial documents by the whistleblowing site. Late Monday, the Ecuadorian government said that in the wake of speculation, it reaffirmed the continuation of asylum that it had extended to Assange for the last four years. It said that the protection would continue as long as the circumstances that had led to that decision continues. 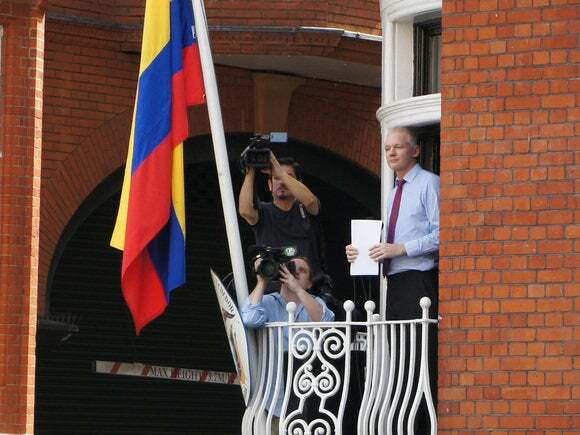 Assange was given asylum by Ecuador in 2012 after he slipped into the country’s embassy in London, where he continues to be holed for fear of arrest by U.K. police, who have said that they have to arrest Assange if he steps out of the embassy to meet an extradition request from Sweden. Assange is wanted by police in Sweden for questioning in connection with a sexual assault investigation, though according to a compromise arrived at between Ecuador and the Swedes, a request from Swedish prosecutors to question Assange at the embassy was granted in August. The possibility of a rift with the Ecuador government became evident earlier on Monday when the whistleblowing site said in a Twitter message that it could confirm that ”Ecuador cut off Assange’s internet access Saturday, 5pm GMT,” shortly after the publication of speeches at Goldman Sachs events of U.S. Democratic presidential nominee Hillary Clinton. Earlier, WikiLeaks had said that Assange’s internet link had been “intentionally severed by a state party.” It said it had activated the appropriate contingency plans. WikiLeaks has recently leaked mails from the Democratic National Committee that showed that the Democratic Party’s national strategy and fund-raising committee had favored Clinton over her rival Senator Bernie Sanders for the nomination. WikiLeaks has also published mails from the account of John Podesta, chairman of Clinton's campaign, which could prove to be embarrassing to the candidate. President Barack Obama's administration and the campaign of Clinton have accused WikiLeaks of cooperating with Russian hackers with the aim of raising questions about the legitimacy of the upcoming presidential election. Late Monday, WikiLeaks’ Twitter account and website continued in operation. On Monday night, the organization announced through its Twitter account the release of the 10th installment of the "Podesta Emails."